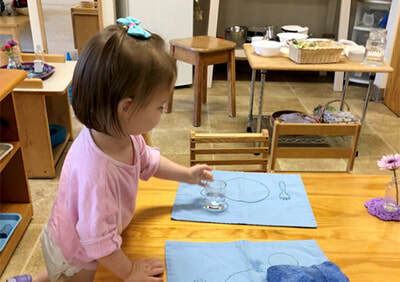 The Toddler program helps to prepare the child not just for school, but also for life. This class for children 18 to 30 months meets three, four or five days a week. Children do not need to be toilet-trained to participate, as toilet-training is an integral part of our Toddler program. Parents, grandparents, or caregivers remain in other rooms equipped with Wi-Fi and coffee while class takes place. The class is composed of three elements: the prepared environment, observation, and non-directive guidance. Classes focus on practical life exercises, sensory exploration, and vocabulary enrichment to help children acquire a sense of order. 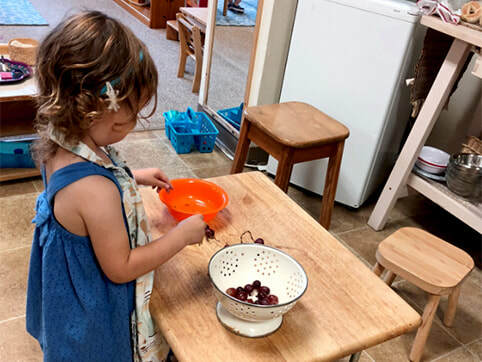 The Toddler classroom allows children to move easily from large muscle movement areas to fine motor exercises, including pouring, sweeping, dusting, buttoning, zipping, and table setting. A child's inclination for independence is respected by giving him skills to accomplish tasks independently. This provides opportunities for freedom and exploration in a safe and loving atmosphere. 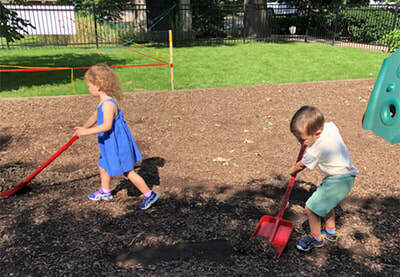 The children learn to take care of themselves and their surroundings and develop skills to communicate with one another. Lessons of Grace and Courtesy help the children develop respect for themselves, for others, and for the (class) environment. Download our Toddler Curriculum Document to learn more about the program.